When I arrived in Florida to play the two events, i was fresh from my successin the bP 3 and felt ready to rumble as they say. My targets were simple on the Edwin Watts Tour Major at Mission Inn I was looking for the victory that would ensure my place in the E Tour finals at Hilton Head and down at Port St.Lucie it was simple as defending champion I was looking to retain this prestigious Florida open Title especially whilst it was at the PGA Headquarters. So as I return home to uk it has to be said my trip was only mildly succesful from a golfing perspective, however i have to say from the Social aspect it was quite a memorable two weeks. At Mission Inn, a fine purpose built golf resort twenty miles North of Orlando , I finished runner up by 3 shots to Flight Leader and Hilton Head Bound playing buddy James Rearden. I was quite happy with my performance in coming back from 7 down to twice get within 2 shots of the leader but in oppresive heat it was a bridge too far but I withheld promosing youngster Broderic Johnsons charge to clinch my place at the National Finals. My tour results a second in the opener and second and third in the majors. Hilton Head here we come. Mission Inn has two exceptional Courses and a fine clubhouse. facilities in Spanish Style are very conjusive to a good golfing break. Its very popular with golfers in Florida, I remember John mein host at the Horse and Chaisse in Venice saying it was his favourite golf break in Florida and who am I too argue. The course I played Los Colinas ( the Hilly course ) was great and the El Campeon ( The champions ) was apparently better and sure looked it too. So off to PGA Village to play in The Florida Open for Golfers with Disabilities and defend my trophy. It was a great opportunity to meet up again with golfers from last year, my good mate Charles Brugh and Tom Walters and remarkably we were paired up again joined by Steve a local one armed golfer. This competition is far more than golf it is great fun, laughter guarenteed from first shot to the last, great comaraderie with people who despite their handicaps have an unbridalled passion for golf. I was determined to give a good account of myself in my defence and for 8 holes I did, Seven pars, one bogey but then the wheels came off as the noon time sun hit over 110, a birdie and a clutch of pairs later on ensured i finished on net 74 so a reasonable defense. At first I was disappointed but as the weekend developed again the ethos of the event far outstripped the competitive nature. I made many great new friends, renewed established acquantancies and I have to again repeat anyone playing this event will inevitably get spiritually fulfilled and a far greater perspective of life, the competive nature of golf that disadvantaged golfers can still participate in with humour and dignity and candour, despite their limitations. The fact it was held here at Golf headquarters enhanced the whole event and I shall return to renew friendships which I BELIEVE WILL BE LIFELONG THANKS TO THIS EVENT. A visit to the PGA Heritage Centre, with The Ryder Cup on display and a full documented history of Amrican Golf this put the cream on top of the cake for a wonderful golf weekend. The PGA Village with its 3 outstanding Courses, exceptional Range Facilities and Training Centre and a Golf Anoraks MUseum to boot... WOW What a weekend. TSG with the Ryder Cup, come on europe.. The highlight of my Golfing year is always my week visit to glorious Nailcote Hall home of the British Par 3 Championship. This fun filled four day festival of golf features celebrities from stage screen music and the sporting arenas, pr golfers of the eniors and PGA Tours mingling with amateurs attempting to tame this 1100 yard nine hole beast of a course. THE CROMWELL at Nailcote. Mingle in TV coverage over 5000 spectators. It is a mesmeric golfing experience. This year, I had spent the 8 weeks leading up to the competition playing my local 9 hole course par 29 at Potters Wood in Wigan. This having Ideal practice facilities, 7 fine par 3s and great greens, I had never approached this event in a better physical or competitive state. The BP 3 has 3 seperate events running during the week. On Tuesday a Celeb -Am where a celeb golfer joins a 3 man team in a 18 hole stableford competition. This year A Social Golfer Team of TSG, Roger Hurcombe along with his new artificial leg in tow and The ledge Steve Skitt, Davenport Ladies Driving Champ, more at home on these smaller holes and finally TSGs great buddy on the celeb tour fine golfer, entertainer and gentleman CLIVE ABBOTT of The Black abbots fame. In this event Clive was awesome, he played level par ( $ under his handicap) and Roger with no hinderance from his new pin... not far behing shooting 59... Fair to say TSG and The Ledge bit part players but who contributed big time on hole 9 each round. We scored twenty under for 92 points finishing joint first. A great start to the week. Days 2 and 3 feature the main event, The Pro Competition and the main Pro Am Competition, this year competing for A weeks All INCLUSIVE for two to MAURITIOUS and The Prestigious HALLIWELL CUP for the winning Amateur. I had been delighted this event had accepted my offer to present the PGA Trophy used at our previous MRC Events which due to economic pressures had ceased. I had been originally paired with Phil Golding who dropped out to play in the Trilby Tour. Fortunately for me he was replaced by in form Midland Euro Pro Tour Champion Simon Lilly. On Day one Simon posted 1 over but as a Team thanks to my play behond my handicap resulted in a team score of 6 under. We were eclipsed by our playing partners on the day Mark Mouland, 2008 Champ here and leading after day 1 with a splendid 5 under and teenage prodigy and fine young lady 14 year old Charley Hull. What a talent this girl his. They posted 9 under. On day 2 , we were the last of the mid morning starters to go out and Simon stated quite clearly his aim was to set a target. We played really well to post 14 under. With his great encouragement, super putt reading by both Simon and his father Jim and Matrons calming influence, despite the pressure MY GAME STOOD THE TEST AND I posted 6 net birdies during the afternoon. We were as they say the club house leaders and suffered a three hour wait whilst the afternoon starters went out, bit of luck it began to piss down, my rain dance behind the 7th green working well. With Team Mouland and Marshall both on the 1th Tee on 13 under it really was a thrilling end as both also were only one adrift of Richrd O Hanlan in he pro event, sadly for them but not for me they could not fnd that elusive birdie and Team Lilly, win the Pro Am...... Yes Matron and I are off to Mauritious and guess who is the first winner of the HALLIWELL CUP... can you Adam and Eve it. Announcer moves in for Sky Sports Interview. Its Green for Go, Another outfit leads to another Trophy. First hole at Nailcote 125 yards, raised Green, deep bunkers, an Idea of how treacherous this Championship Course can be......... The Pro's after 36 holes will be delighted with Level Par, this gives an idea why. I hope to have many videos and pics from this year competition available daily from 11th August. Here I slightly pull a 9 Iron into the left hand trap then as you can see have a bit of a problem, still I escaped with a 4. But it all starts at home with The British Par 3 at the magnificent Nailcote Hall from 11th to 15th August on SKY TV as well.... 2 celeb Events and the National 2 day 36 hole Championship. In the Pro Am last year, with a fine pro and gentleman Andrew Collinson, we finished 5th out of 64. Looking to go better this time. 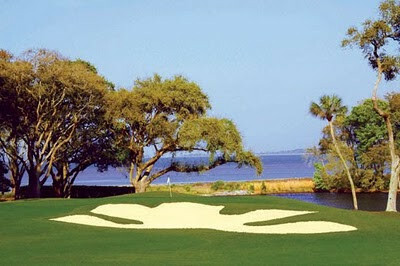 On the following Monday, Karen will accompany me back to Florida to play in the major at Mission Hills. This is a course new to me but very highly rated. I will need my a game in this two day event but I have finished 2nd and 3rd on Tour this year so I know what is needed. A top two place should ensure I'm back at Hilton Head for the Nationals. hope I don't meet this guy again in Carolina at Hilton Head. From there we will head down the Atlantic Coast to Palm Beach and the former Ryder Cup Venue at The PGA West, this year host to the Florida Open For Golfers with Disabilities. There I will meet up with many old acquaintances, particularly my owd mucker Charles Brugh as I attempt to retain the trophy. with the impressive Florida open Championship Trophy. Following my return, A social Golfer Team will return to West Midlands Golf Club to try and improve on our 3rd Place last year in the Frank Worthington/John Lowe Celebrity Classic. 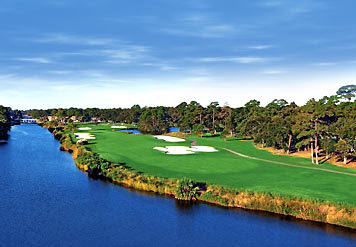 This fine course as a Sawgrass Type 18th as its signature hole and is a fitting location for such a prestigious event. Steve, Tom and Ralph, hope there not all blaming each other this year. The final hole in front of the majestic modern clubhouse..... 154 yards all carry and The Social Golfer nailed it last year and won nearest the pin. The end of the month and I will head to Tenerife to play in a couple of events in this sunshine paradise in the Canary Islands. In 1998 The Social Golfer wins The Wild Geese Charity Event and Tsg team won the team prize. I have not had much success in The JR Classic finished 6th last year and looking to improve on that. Having won the Edwin Watts Tour spring Major at Southern Dunes last year. I had planned my spring season around a defence of this title to be held at Grande Pines just off the famous International Drive in Orlando. The whole trip was more difficult than I had imagined as this venture I had to go solo, matron deciding after our 3 month road trip she had done enuff flying. Grande Pines was in pristine condition, the best of the 4 courses I played on this trip. Weather was scorching and despite an horrendous start to my last round when only trailing by two from class leade James Rearden, I tripled 1, 2 and 3 and at the turn was 8 adrift and tied 6th, when I put together a fantastic last nine which took me on to the brink of a play off with a putt on the last to force a tie with James. Still a spirited defence, a worthy winner and I shall return in August for a tilt at the Summer Major at Mission Inn, followed by my defence of the Florida Open at PGA West Palm Beach, former host of a Ryder Cup. Hopefully a reasonable place here will ensure with my two seconds so far, enough points to qualify for the Nationals at Hilton Head Again for a second tilt at The Biggest Crown on the E Tour Amateur circuit. I also played on trip two of the renowned courses in Orlando that had so far over the years eluded me. Royal St.Cloud and Harmony Golf Preserve. both south East of Orlando along the famous US 192, so very handy for most tourists. I am pleased to report both are very fine tracks and should be on any visitors itinerary if visiting he land of Mickey. Thoughts now turn to home, sadly because of my ewtour commitments it appears I may not be able to play in this Years Peoples Open, the final being in August when I am due back in Florida. I deeply regret this the opportunity to play at St.Andrews being one I had wanted to have a go at. Fortunately I will be able to return to the British Par 3 the week before I fly out to Florida. Strongly confident of going even better than my fifth place in the Pro Am last year. My next outing sees me in the midlands at Henley in Arden playing as a guest celebrity in THE SHOW AM Charity Classic in a Social Golfer 4 man Team. Wish us Luck!!!!!!!!!!! Stonegate Solvita, a fine example of an Orlando Golfing Experience. The last leg of our 30,000 mile trip saw us return to our Florida villa for a fortnight. To all intents and purposes both Karen and I effectively feel our journey is over, even though we have the Atlantic to cross before we can say officially we traversed the globe. so whilst it was a good chance to have some R and R, see what damage the Floridian Frost had done to the garden, not a pretty site. For me it had some important golfing matters to conclude the Golfing Odyssey. Firstly I would play in the season opener at Black Bear on the Edwin Watts Tour. In view of my restricted schedule this year, this event was far more important than a normal event as it would be imperative I finished up the field to gain vital points towards the end of season Nationals. I only intend to play both majors on tour so I have my work cut out. Secondly and very important on a personal note my final commitment was to meet up with my great buddy Brew to celebrate an important date in his ongoing recovery. as it turned out I also had opportunity to meet up with two great old golfing buddies, my Toys for Tots winning team partner Scott Ramey and Rich Poore from London who I first met 12 months ago at Championsgate. It gives me particular pleasure as The Social Golfer to meet up with fellow SGs ongoing. I also as part of important practice added to my Orlando resume by playing Kissimmee Oaks and Solvita Stonegate. I have now virtually played every Public or Semi Private Course in the Orlando Area giving me an unrivalled tourist position from which to comment. 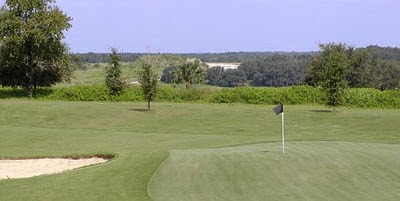 Black Bear is a fine links style course just south of Eustis with undulating fairways and fast hard, quick breaking greens. A fine clubhouse, enhances an enjoyable experience. My fourball featured some of the best in our class on tour, my good mate James Rearden, third on last years standings and still waxing lyrical about our sessions at Hilton Head. Big Hitting Alberto Esperon and Steady Eddie, Jerry Harris. To be in the running, I clearly needed to win this particular 4 ball. Jerry, Alberto and James, three great guys on tour. James in particular started like a house on fire then on the 12th when 5 ahead of me, put his approach ob and from then on imploded Alberto who led me all the way till the 15th where I get up and down from 130 yard bunker for a par 5 and he 3 putts from 3 feet for an 8. Not without some trouble the water on the fantastic 18th contributing to a 7, I come home one clear of both james and alberto and two clear of jerry, which enables me to finish second in the class, pick up 250 ranking points and my first check of the year. I go now to defend the first major of the Year, this time at Grande Pines in May in good heart and look forward to locking horns with these great guys again. 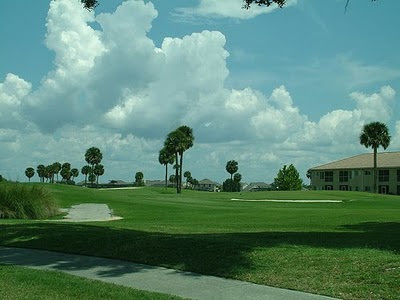 I played two new courses leading up to the tour event, in Kissimmee Oaks and Stonegate, Solvita. Both were fine tracks but had clearly suffered from the bad winter the Floridians had encountered, I will return in Summer when I feel both will have a lot more to offer. The bird life around Solvita literally had me salivating with pleasure. A final point there was no signs of economic recovery on either estate, no Legends or Ridgewood which I also played, with he no of foreclosures and sales growing from my last visit in October. Kissimmee Oaks, fine track, super vfmoney. As I stated earlier, whilst in Orlando I was contacted by two fellow Sgs down in the area for a bit of sun. 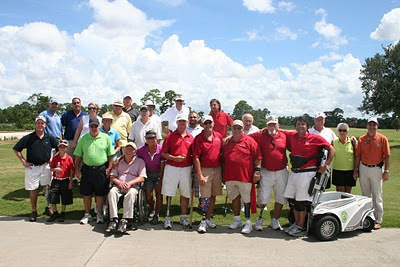 Scott, whi I last saw when we won the Annual Toys for Tots at Mystic Dunes back in DEc 2008 invited me to Clermont for my second go at the Legends and with two business mates of his down from the North Ted and Mike two damn fine SGs we had a great day. I was also contacted by my Oxford pal Richard in Orlando for a break with his good lady and we had a fine day ar Ridgewood joined b John and Carol, snow birding down from North America. This day ended with Karen and I joining Rich and his party at Bergamos, to have a Great Italian and listen to the singing waiters. Social Golf at its best. Carol is some putter, she made the Greens notoriously difficult look EASY!!!! I pray this note finds you and your loved ones eager in spirit and full in health. I have a few thoughts I wish to convey. I’m hopeful you find words of much interest. My near- fatal, life-altering motor vehicle accident occurred on March 21st, 1990 (the first day of spring that year). I’m told I had a tee time scheduled the next day (22 March 1990). Instead of spending a glorious spring day in Florida, leisurely hacking my way through 18 holes of golf, I would spend that day comatose in the Critical Care Unit tenuously clinging to life. In fact, I would spend two comatose weeks fighting for my life. At the time of my automobile accident I was an invincible 25-year old aspiring Naval Aviator and full-time student. I was also working full-time. What precious free time I had was usually spent at the beach or on a golf course. When putting out that last hole, I never dreamed I may have just played the last round of golf in my life… “When you’re faced with the realistic possibility that you have played your last round, then your worst round is better than no round at all”. Ian, truer words have never been spoken! I’ve spent two decades of prolonged, painful rehabilitation desperately rebuilding and recovering “me”. I’m reclaiming my physical, intellectual, and spiritual self neuron-by-neuron, synapse-by-synapse. My goal has always been to not merely learn to live with traumatic brain injury (TBI), but to conquer traumatic brain injury. It has never been easy. It is still not easy. If your schedule allows, I would consider it a great honor to golf with you and my golfing instructor, former PGA TOUR Professional Charles Raulerson, at the Country Club of Orange Park (www.ccofop.com) on Monday, 22 March 2010. Albeit 20 years late, I will finally make that tee time I had scheduled two decades prior. I cannot think of a more fitting way to mark an anniversary of my near demise than to celebrate life on the links with my good friends, Ian and Charles! The Day after his accident he had booked a tee time at 12.15pm which he of course never made. Exactly 20 years to the day he did make that tee time and I was privileged to join him and a wonderful PGA PRO, Charles Raulerson, Head Pro and General Manager at the magnificent Orange Park Country Club, to celebrate his recovery by playing this long awaited round. In a trip of many highlights, this was up there with them all. Truly memorable and a Sensational ending to my once in a life time global golfing extravaganza. to card a bogey 5 after sinking a 25 footer. NICK FALDO, SEVE and now The Social Golfer his resume is complete. AND SO THE END IS NEAR and so I reach the final curtain, and what a journey it was, Memorable in so many ways, Fantastic Golf, Sensational Vistas but for both Karen and I our long abiding memory will be the wonderful people we met along our travels, some I now consider much more than passing acquaintances. You all touched us deeply and I sincerely hope that was reciprocated.To each and every one of you, THANK YOU!In times of Economic and Social Turmoil, this trip gives me considerable optimism for the long term well being of our planet. I have learned a lot about myself, a lot about my golf..... and a great deal about this majestic green and blue globe we call home. The work starts now as i try and take all these experiences and put them into something worth calling literature, naturally when published I will be in touch with you all. were my heroes have took the Test. cuz they are simply the Best. I am pleased to say next week, The Social Golf Team returns to action in THE PUBLICAN Knockout hoping to go one better than last year. The first ever SOCIAL GOLFER OPEN takes place at Hever Castle in Kent on Friday 16th April with over 60 competitors. my Edwin Watts Tour will see me play both majors in May and August at Grande Pines and Mission Hills hopefully culminating in a return in Oct to Hilton Head. Failing that the Barney Barnato in Kimberley could beckon. 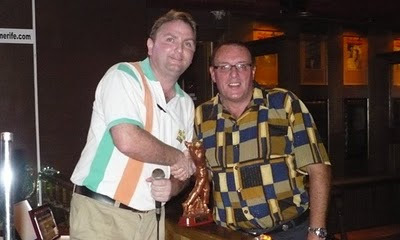 Also my annual trip to Tenerife in Sept to try and regain the Wild Geese Trophy is very much a goer. LOVE LIFE, ENJOY THE GOLF and ALWAYS SMELL THE ROSES. Back to Vegas and at last some Golf to report. Once again choosing the course closest to the City, led me too THE BALI HAI and a fantastic day and experience with two great German Guys Jens and Manfred and Jim from Wisconsin a fine 2 handicap golfer. Joined by our Caddy Mike, we had a wonderful day, some magic golf mixed with mediocrity as is SOCIAL GOLF. Established firm friendships and in Mikes case some exceptional Green reading gave me my best putting of the trip. Thanks!!! The course was in the shadows of the strip and despite being directly under the airport flight paths is quite stunning visually. Some Sensational holes and Course Conditioning despite unseasonable weather for Nevada was exceptional. Like everywhere this trip course bookings are down leading to some sensational offers available. As mentioned previously, I had been very much tied by dictates of the travel side as well as the Golf and San Francisco proved to be the most difficult to arrange. During our 3 days there, I had considered as usual the two main criteria for the Social Golfer. 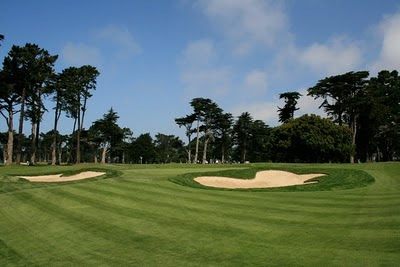 Walking in the footsteps of heroes...... Hardings Park a Public Course that hosted the last Presidents Cup, The Olympic, regular US Open destination and the top twenty rated San Francisco Golf Club. A mixture of atrocious weather, it hardly stopped raining and once again private non reciprocal arrangements... ie members only made it impossible to get a round in the small window of opportunity I had. 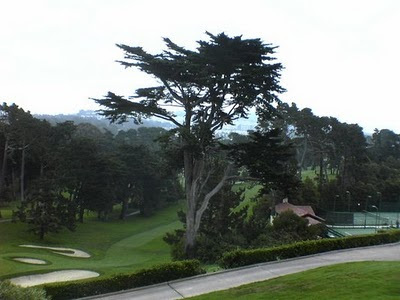 The Presidio redesigned by Arnold Palmer and open to the public since 1995 meanders thru the hills overlooking the city and golden gate and Alcatraz. 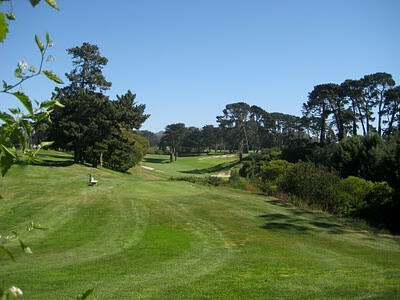 For less than $90, George Fuller in Calafornia Golf places it in the top 30 in the State and describes it as a MUST PLAY. I tried but the weather beat us. A rolling Thunderstorm of the bay put paid to that. 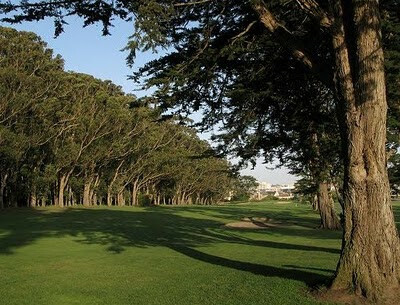 According to all info I collected on San Francisco, The 3 finest courses were all located on a small stretch of land in South San Fran along The Pacific Coast. This terrain clearly similar to the Sandbelt in Melbourne hosts The Olympic, Hardings Park and The San Francisco Golf Courses. It is also San Franciscos most affluent of Residential Areas. The former and latter are Private Courses and I was simply unable to sort out a Tee Time in the timescale we had. Hardings Public, was sadly another victim of the Terrible weather. Hardings Park was available at the amazing price of $88 for a round, what value. The Olympic has two courses. The Lakeside which hosted the Us Open in 1955,67,87 and 98 and the shorter,tighter and still highly rated Ocean Course. Guests can only play with a member. San Francisco is rated the best of the three in all ratings I examined prior to the trip. Tom Doak renovated the course in 2002 and its now accepted as a true great. Hosted the 1974 Curtis Cup Match which no doubt the USA thrashed GB. Again Guest can only play with a member. Again disappointingly there is no reciprocal policy in place. A place I must re visit in good weather and tie in with a trip up North to Oregon and Bandon Dunes perhaps. Dont tell Matron.